To break through the clutter of disingenuous shaving commercials, we created eye-catching sophisticated illustration design through short form video and digital banners driving to purchase on a newly-designed product website. eos added shaving cream to its minimalist, premium product line. 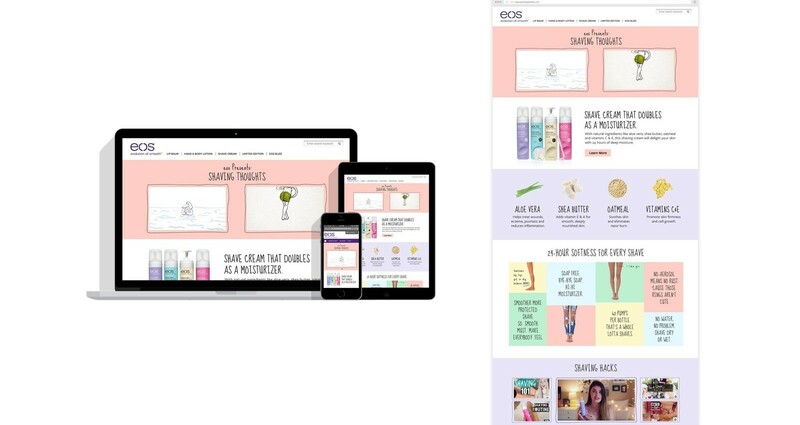 Our challenge was to align the sentiment for eos lip products with the category-changing new shaving cream by creating a campaign driven by audience insights discovered through social listening tools. We worked with illustrator Mike Perry, known for his work on breakthrough female comedy hit, Broad City. The updated, modern design was applied through short form video and digital banners and a newly-designed product website.